In Acts 4 we have several public characters mentioned who had a part in the trial of Jesus or in the opposition to the new movement of believers in Jesus as Lord and Christ (Acts 2:36). I will call attention to two of them. The first is a religious leader, and the second is one of the Roman procurators or prefects. Caiaphas. Caiaphas was the son-in-law of Annas. He was appointed high priest by Valerius Gratus, procurator of Judea, in A.D. 18 and deposed by Vitellius, legate of Syria, in A.D. 36 at the same time Pilate was removed as procurator of Judea. Caiaphas was the Jewish high priest before whom Jesus was tried (John 18:13-14, 24). According to Josephus, Caiaphas was named Joseph Caiaphas (Ant. 18.2.2). 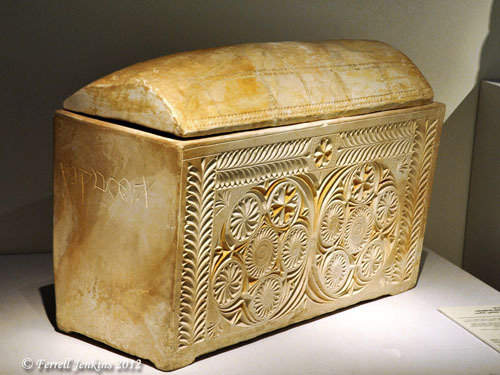 Ossuary bearing the name of Caiaphas. Israel Museum. Photo by Ferrell Jenkins. Pontius Pilate. Pilate was the Roman procurator of Judea when Jesus was crucified (A.D. 26-36). 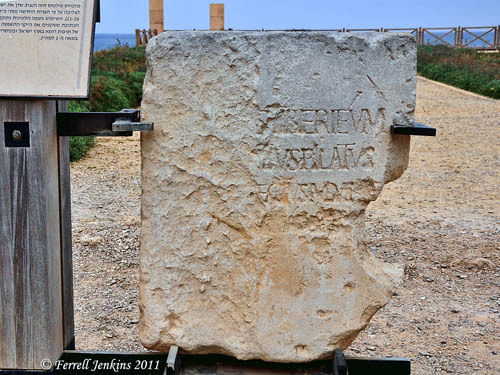 An inscription bearing the name of Pilate was discovered at Caesarea, the residence of the procurator, in 1961. The stone is thought to have been used in the dedication of a statue or some public building. The original is in the Israel Museum but a replica is displayed at Caesarea. Murphy-O’Connor suggests the following translation of the Latin inscription: “Pontius Pilate, Prefect of Judaea, made and dedicated the Tiberieum to the Divine Augustus” (The Holy Land, 3rd ed., 215). This entry was posted in Archaeology, Bible Study, Israel, New Testament, Photography, Travel and tagged Book of Acts, Ministry of Jesus. Bookmark the permalink. In your presentation you mention about Pontius Pilate “procurator” and then Murphy-O’Connor wrote “prefect”. What is the right term to use? In outlying provinces like Judea, a governor (prefect) had military control, was responsible for financial administration, and served as a trial judge. Pilate had authority to release Christ, but he yielded to Jesus’ foes !